Every story is extremely well written, blending together gentle humour and poignant observation within interesting settings and situations. The endings are never predictable and always pleasing. I liked her device of prefacing every story with a quote from a great writer, and at the end of each tale I revisited the quote that prefaced it to remind me what was and to understand its deeper meaning in relation to the story. 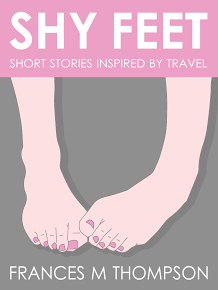 Although part of the fun in this short story collection was to enjoy the settings and take more or less a round-the-world trip, there is also a sub-theme of “not travelling”. I was reminded that wherever you travel, you always take yourself and your problems along. A rewarding by-product of the author’s career as a travel writer, this book of fiction indicated to me that the author must spend a great deal of her travelling time people-watching. It’s good news that, thanks to her profession, she will never run short of material. More, please! One of the stories in here, See The Amalfi Coast, is now available as a free e-book sample, where you can also buy a paperback or e-book of the whole collection. To find out more about Frances M Thompson, visit her website: www.asthebirdfliesblog.com.